Born on April 2, 1939 in Washington, D.C. Marvin Pentz Gaye, Jr. was named after his father, a minister of the apostolic church. From a young age, the church played a large role in Gaye’s music career. He began his musical profession in his father’s church choir and began playing the organ and drums. After several years in the church, in 1957 Gaye left his father’s church and joined a group known as the Marquees. After a year, the group was guided by the producer and singer Harvey Fuqua who inspired Marvin’s musical career. When Fuqua moved to Detroit to further pursue his music, Gaye went with him. In Detroit, Harvey was able to join forces with another music talent, Berry Gordy, where Gaye became a session drummer and soloist for the Motown Records label. Over the years, Marvin Gaye, Jr. began to sing several duets with the leading ladies of Motown. One of these ladies, Tammi Terrell became one of Gaye’s close friends but died in 1970 due to illness. 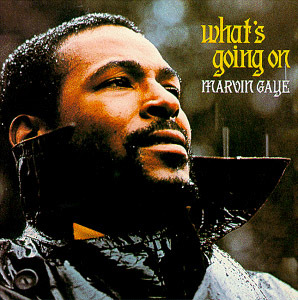 Gaye returned to solo work, which eventually produced his most successful “concept” album in 1971 which pursued environmental and anti-war protest themes among others. Some of the songs in his hit album included the number one hit “What’s Going On,” and “Mercy Mercy Me” and “Inner City Blues.” Gaye’s new style soon influenced black performers all across the nation. In the early 1970s Gaye sang more sexually explicit songs such as the 1973 hit “Let’s Get It On,” and nine years later in 1982, “Sexual Healing.” Gaye’s music masked personal problems that increasingly plagued the singer. He went through a bitter divorce from Anna Gaye in 1975 and moved to Europe to establish a new life in 1980. When he returned to the United States in 1983, he moved in with his parents who were living in Los Angeles, and suffered an intense addiction to cocaine which left him unable to record any more albums. Because of his depression and addiction, Marvin Gaye, Jr. was in constant conflict with his father Marvin Sr. These conflicts eventually lead to his father shooting and killing him in self defense on April 1, 1984.